At 31 years of age, I'm trying my best, but I'm also aware I have nothing resembling the amount of control I thought I would have over my life. Things happen, seemingly with either too great a reaction or no reaction at all, and I'm left wondering if there isn't an entire set of instructions I've missed. Sometimes I try to go with the flow and let life dictate my destination, but I'm too easily swept by the current into endless circling eddy's -- doldrums of passionless existence. And when I push too hard, everything falls apart and I can feel myself losing everything I've worked toward. You can either crumble under your own ambition or succumb to inactivity and for some reason I have never uncovered the trick of striking any point in between. 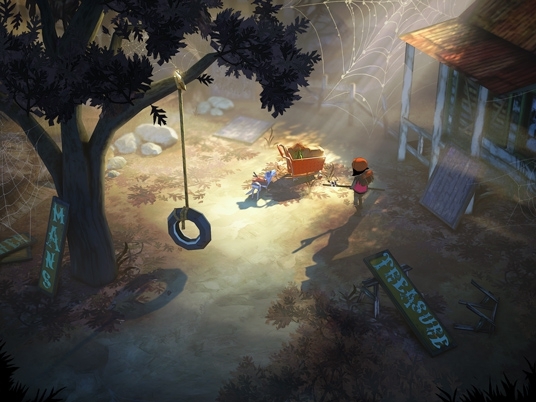 Maybe that's why The Flame in the Flood punched me right in the goddamned heart.The rogue-like game with a delightfully cute art style opens on a dog retrieving a backpack from a skeleton. (Spoiler: this skeleton will be you, many times.) The dog brings the backpack to a girl sitting by a fire and thus begins a hero's journey to survive a quest of exploration in a post-societal America. Each time you die, the dog finds your backpack and passes it on to a new girl at the campfire, beginning the quest anew. And oh boy will you get used to starting from scratch. 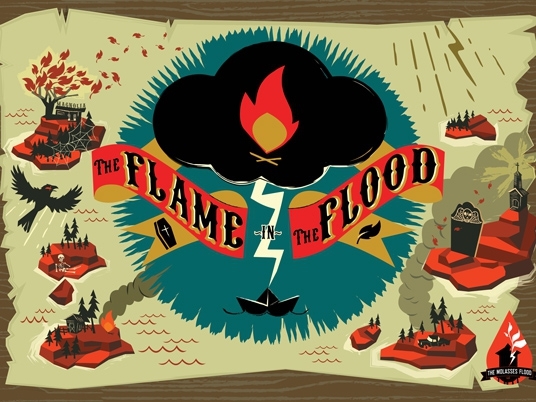 Built on similar mechanics to games like Don't Starve, the world of The Flame in the Flood is predicated on exploration mixed with crafting, with a much shallower focus on combat. The dog "Aesop" helps the woman protagonist "Scout" located items and focus attention on possible dangers. Meanwhile, Scout needs to stay on top of of a whole cavalcade of depleting resources. The player needs to remain mindful of hunger, thirst, injuries, energy levels, sleep, and unending management screens based on found materials, plant life, and tools. Time is a killer, and I wound up starving to death while taking a nap, or succumbing to blood loss while in-menu crafting a healing device. Time is a brutal killer. It was three playthoughs before I made it far enough to even encounter an actual enemy, much less another human being. While the game involves lots of exploration by foot, the other half based in a completely different style of play that really shakes up the tempo. See, the world has gone all post-apocalyptic for some reason, and a massive river runs through the remains. Scout has a raft, crafted from the boot of a car, that she and Aesop can ride to explore new islands and pursue both a strange radio signal and the answers about what has happened to the earth. The river itself is the most important character in the game. This procedural generated adventure sees your two protagonist naively attempting to run the gauntlet toward redemption, and the waters beneath you are both your greatest friend and your most unrelenting adversary. Navigating the waves is unyielding at best and impossible at worst. Rocks, outcropping, garbage, monsters, and even entire structures are constantly criss-crossing the world in an effort to destroy you -- and yes, it does feel like the environment is teeming with bloodlust. But then, you'll hit a patch of incredible rapids, where your speed quadruples and suddenly you've re-emerged in a new zone while activating one of the game's rare checkpoints, entitling you to a wave of relief at some measure of meaningful progress. The river is such a brilliant game mechanic, because the land work can become... repetitive. So the sudden rush of wind in your hair and the world at your back yields impressive results. Sometimes you just have to run away from your problems, and there's a constant feeling that "Flame" lets you do this. You may be left unprepared for large challenges ahead if you bail on what's in front of you, and sometimes that path carries damnation with it. Being forced to double back and take responsibility for your self-care, rather than plowing forward feels very real - and that message feels so much bigger than what I thought a game of this size could be capable of mastering. But it does. The team at The Molasses Flood has taken a Kickstarter project and churned out something small, and intimate, and undeniable that seems to exist to speak directly to me. And if that's true, it probably speaks directly to you as well. Brock Wilbur is a critic, filmmaker, stand-up comic and huge 6'7" monster who loves you. You can follow him on Twitter @brockwilbur.